Hypersonic anti-ship missiles – incoming? Ben Schreer wrote earlier today about the strategic implications of hypersonic weapons. Now we’ll have a look at some of the military technology implications. It’s worth noting that there are some difficult problems to be solved in not only getting the vehicles to fly (six minutes counts as a success), but also in accurately targeting vessels well out at sea, and then finally manoeuvring the vehicle to hit the target. But for now let’s assume that these are solvable problems and look at the implications. There are two main appeals of a very high speed weapon. First, its shorter arrival time greatly complicates the lives of defenders. 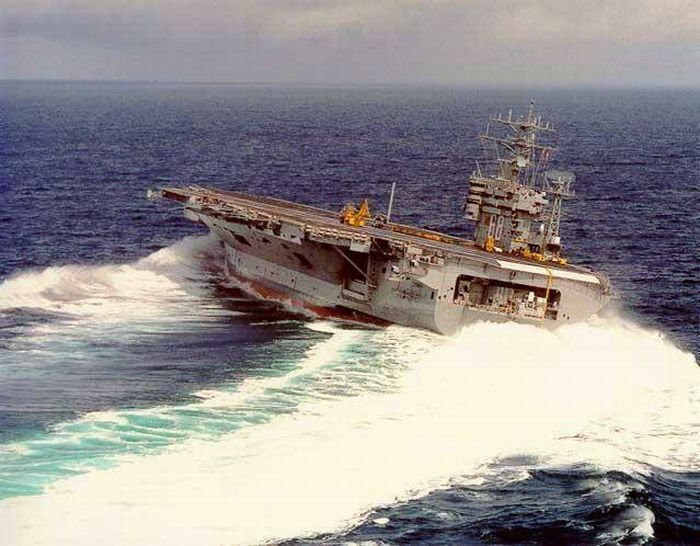 For example, a subsonic missile such as Harpoon or JSOW skimming the surface of the ocean takes a little over two minutes to travel from the horizon to impact on a vessel. A supersonic missile such as the Russian P-270 Moskit takes about half a minute at maximum speed. A missile travelling at Mach 6 (about 2 km per second) arrives just 16 seconds after appearing above the horizon. For the defenders, the incoming missile has to be identified, tracked, targeted and engaged. And if the first attempted intercept fails, follow-on attempts have even less time. That’s why anti-ship missile defence systems such as the Evolved Sea Sparrow and SM2 missiles to be carried by the Navy’s new air warfare destroyers are both capable of speeds of over Mach 3.5. That gives them a fighting chance of countering incoming P-270s and their ilk. Hypersonic systems would swing the timing balance back in favour of the attackers. The other appeal of a very high speed weapon is the amount of energy it brings to an engagement even without an explosive warhead. The energy of motion (‘kinetic energy’ or KE) of a missile is proportional to its mass and to the square of its speed. Doubling the speed gives four times the KE, so you literally get more bang for the buck if you can make the missile faster on impact. The effect on the target is due to both the explosive power of the weapon plus the energy it brings to the collision. The Harpoon relies heavily on its warhead for effect while the hypersonic weapon delivers a similar amount of energy, but entirely KE. The P-270 delivers more of both. That’s not to say that the Harpoon’s KE is negligible. During the Falklands War HMS Sheffield was struck by a similar Exocet missile. It failed to explode, but the ship was mission killed by the impact and later sank, following a series of fires started by the weapon’s unburnt fuel. An impact from any of the weapons in the table would likely cause grave damage to a warship—at least disabling the vessel as far as effective warfighting is concerned. A related concern is that even successfully hitting an incoming weapon mightn’t be enough if it’s close enough to the ship. The effectiveness of the Phalanx gun (a ‘last ditch’ close range rapid fire system for when other defences fail) has been questioned on the grounds that the debris from the missile will continue on its inbound course and hit the ship anyway. Breaking up a hypersonic projectile could have the same effect—the pieces will still carry most of the kinetic energy of the whole. So what can the defenders do? This isn’t the first time that anti-ship weapons appear set to decisively defeat surface fleets; previous candidates are the submarine and aeroplane. Each time ship defences have managed to more or less catch up. There are fundamental reasons to think that one day the balance will swing decisively against surface vessels, but that’s a provocation for another post. It’s worth noting that shipborne defences haven’t been severely put to the test since the 1982 Falklands War—and then it was seaborne air power which tipped the balance marginally in Britain’s favour. The defending forces will try to engage the incoming weapons as far away as possible, and for the reasons explained above, will also try to manoeuvre away from the path of even successfully intercepted projectiles. They’ll also try to target the sensor systems the weapon uses for terminal guidance—the further away the better. And there’s a lot to be said for being faster than the weapon you’re trying to hit. Hypersonic defensive weapons are one possibility, but another is directed energy weapons—which would allow the defences to react at the speed of light, allowing multiple engagements in the 15 seconds available. Whether that’s feasible or not remains to be seen (just as for reliable hypersonic weapons with terminal guidance). The problem of avoiding the blinded ballistic body would presumably demand engagement at maximum distance and maximum agility by the 100,000 ton aircraft carrier. Funnily enough, I haven’t seen the terms ‘maximum agility’ and ‘100,000 ton aircraft carrier’ in the same sentence before. The photograph (above) suggests that the first response to the detection of an incoming hypersonic missile may be tying down the aircraft. Andrew Davies is senior analyst for defence capability at ASPI and executive editor of The Strategist. Image courtesy of US Navy.